Apple Polishing Systems is an environmental and eco-friendly auto detailer. Our first goal is keeping water runoff out of or storm drains while were conserving more water than ever! And use eco-friendly products. We need to conserve water in San Diego and water rationing is something we are going to have to get used to. In fact, mandatory water rationing is in place in other parts of the country as well. This grim reality affects everyone who likes to keep their car clean. 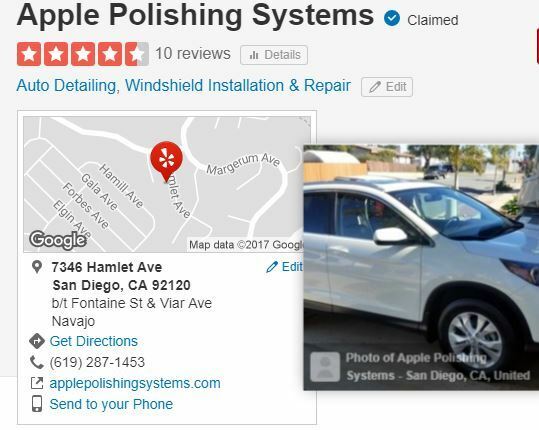 Since I own and operate an auto detailing service in San Diego I have looked hard at this problem and done a good amount of research. In my business, we have complied with the local water runoff and reclamation laws for years but now we also have to save water. I care about our environment and want to do my part to preserve our natural resources, so I looked at the alternatives. A waterless car wash can be done by almost anyone, doesn’t require any special skill and is inexpensive. There is really no such thing however as a completely waterless car wash since there is water in the car wash solution that you spray on the car. Also when you think about it, you will use a lot of water running those dirty towels through your washing machine. Those towels will degrade quickly and begin scratching the car’s finish as they deteriorate so you will need to buy new towels often. You will also develop a layer of sludge that will build up in your washing machine and will need to be cleaned regularly so you don’t spoil your nice clothes. This is a decent alternative but I felt I needed to look further.